4. 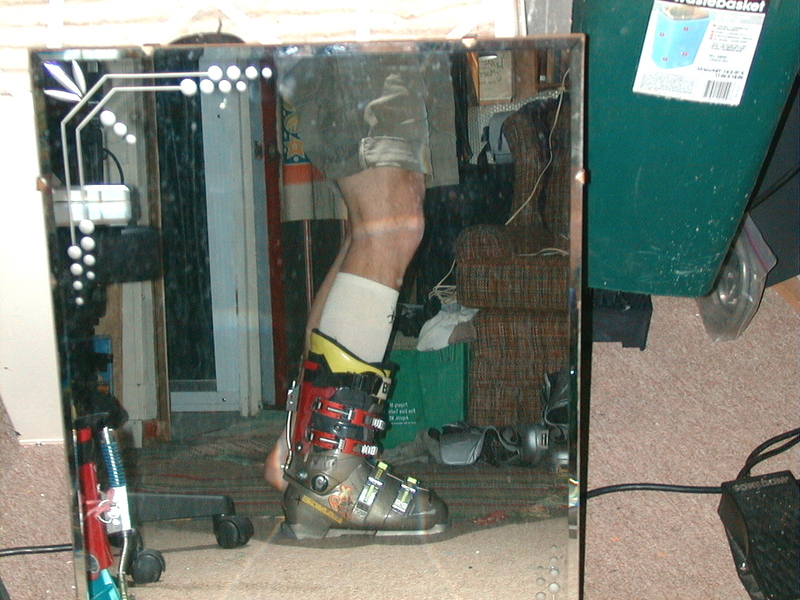 Forward lean, front boot. The forward lean of the boot should support the knee joint in what I refer to as a faceted position. This is the degree of knee flexion that requires the least amount of muscular activity to maintain, where the bones stack most effectively. Think of it like this: you are standing at a bus stop with no benches, waiting for a bus to show up that isn’t going to for quite some time. Get comfortable. The cuff of the boot should be set to support this degree of joint flexion, but not impose further flexion. Similarly, if you need to straighten out your leg to feel the cuff, there is insufficient forward lean. If you have a large calf muscle, as I do, you may need to cut away the back of the boot for clearance, and then bolt on a cuff from another boot to restore support. If you are riding a boot without a removable boot-board, then you may have to revisit forward lean after the compound toe heel height has been derived. This means most of you, as I assume most of you are not using ski boots.